Jignesh Mevani, student leaders Kanhaiya Kumar, Umar Khalid and Shehla Rashid condemned the murder. The murder of journalist-activist Gauri Lankesh on Tuesday night outside her residence in Bengaluru has sent shockwaves across the country. The Karnataka journalist had been vocal against right-wing forces and Hindutva politics. Gauri Lankesh, an editor who had bravely criticised fascist forces, political powers and helped bring Maoists to the mainstream was shot at point blank range at her house on Tuesday evening. 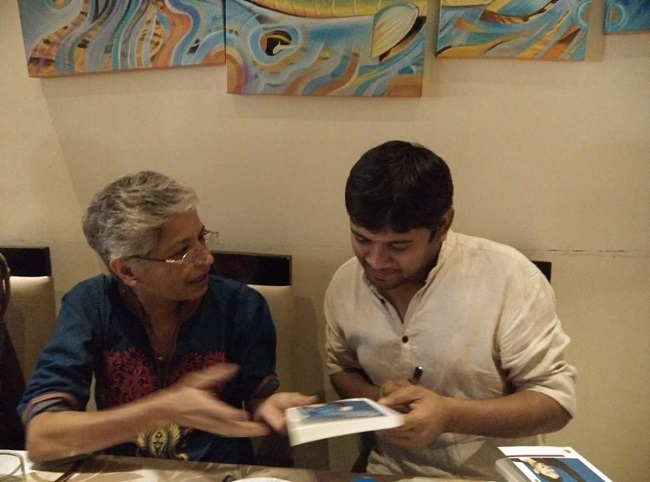 Known to be a staunch supporter of student politics, Gauri Lankesh was a mentor to many student activists and had often referred to JNU student leader Kanhaiya Kumar as her adopted son. Hours after she was shot, Jignesh Mevani, the Dalit leader from Gujarat, expressed shock at the incident. Saying that she paid the price for being fearless and doing every bit to fight against Sangh and BJP, Jignesh said that the fascist forces will "kill each and every voice of dissent." Sharing anecdotes of his close engagement with Gauri over the years, Jignesh said, "She would always tell people that Jignesh is my good son and Kanhaiya is my bad son. She would love both of us equally. I can't believe that I won't be able to see her again. I won't be able to take khakhara from Gujarat for her ever again. This is a major loss for the civil society of Karnataka. This is the murder of democracy and rationality. Down with dark devil forces who killed such a beautiful soul... Gauri you will always and always remain in my heart, in our hearts," Mevani wrote. Taking to Facebook, former Jawaharlal Nehru University students' union president Kanhaiya Kumar said that Gauri's murder has only strengthened their resolve. "You are not dead. We are not afraid. This strengthens our resolve to fight. #GauriLankesh was a strong supporter of students' movement," he wrote. He added that the senior journalist had taught him to speak truth to power. "She was fearless in her fight against hate. We resolve to carry on her struggle," he said. Condemning the murder, JNU student leader Shehla Rashid said that while "investigating Gauri Lankesh's assassination can expose Sangh terror networks like Abhinav Bharat," no agency will conduct such an investigation. She said that Gauri Lankesh was the kindest person she ever knew. Taking to Facebook, JNU student leader Umar Khalid said that the assassins' bullets cannot silence Gauri's ideas. "Enraged and shocked by the assassination of Gauri Lankesh who was a vocal critic of Hindutva fascist forces. To me, she was more than just a journalist. She was a strong supporter of the JNU movement, a friend and she used to call me her son - one of the four she has adopted as she would say (Me, Anirban, Kanhaiya and Jignesh Mewani). Rest in Power Friend, Comrade, Mother," he wrote.